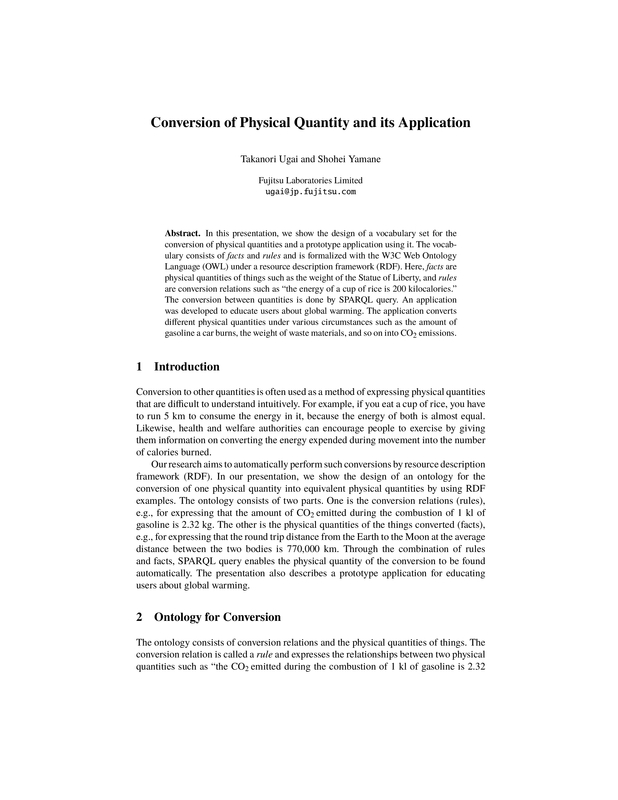 In this presentation, we show the design of a vocabulary set for the conversion of physical quantities and a prototype application using it. The vocabulary consists of facts and rules and is formalized with the W3C Web Ontology Language (OWL) under a resource description framework (RDF). Here, facts are physical quantities of things such as the weight of the Statue of Liberty, and rules are conversion relations such as "the energy of a cup of rice is 200 kilocalories." The conversion between quantities is done by SPARQL query. An application was developed to educate users about global warming. The application converts different physical quantities under various circumstances such as the amount of gasoline a car burns, the weight of waste materials, and so on into CO2 emissions.